The Rt Hon David Blunkett MP, Secretary of State for Education, handed the Special Educational Needs “Silver Award” to Inclusive Technology at the BETT Exhibition back in 1998. The “Gold Award” went to QED Ltd which merged with Inclusive Technology in 2010. 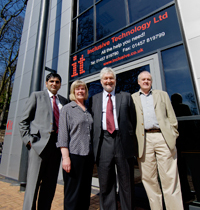 In 1996 Inclusive Technology was the new education division of Manchester-based Ocean Software Ltd. The education division’s founders: Trish Hornsey, Roger Bates and Martin Littler, had set up this new special needs outfit in the on leaving their previous employer (and there hangs a tale!). The three teachers each had a grounding in special education and IT. Martin Littler had been Director of the Government funded Special Education Micro-Electronic Resource Centre (SEMERC) for ten years since 1986. Trish Hornsey was SEMERC’s Development Manager after working as the Special Education/IT Advisory Teacher in Calderdale. Roger Bates had been Director of the Northern Aids to Communication in Education (ACE) Centre. Simultaneously, as the trio set up Inclusive Technology, Ocean Software, their parent, was purchased by French games giant, Infogrames which had closed its own education division and didn’t want to start another. This was the opportunity for the three to stage a management buy-out (MBO) and Inclusive Technology Ltd as a separate independent entity came into being on 1st April 1998. Sixteen years later in 2014 Inclusive Technology has just collected a fourth BETT Award for “ICT Special Educational Needs Solutions” and the 2014 American CODiE Award for “Best Solution for Special Needs Students”. The solution in question is breaking new ground. ChooseIt! Maker 3, a cloud-based application, is allowing teachers to make personalised Apps for their students to play off-line on their iPad and Android tablets. In between awards Inclusive Technology had pioneered the introduction of integral touch monitors into education, led the introduction of interactive plasma screens, and become the world’s leading developer and publisher of accessible software for the severe and complex special needs market. This was recognised in 2010 when Inclusive was voted “ICT Company of the Year” in that year’s BETT Awards. Through a subsidiary, Inclusive Consultancy & Training Ltd. (ICT) the company with partners from the RNIB, DSA, the ACE Centres and CALL Scotland had undertaken a Government contract to train 7,000 teachers from Special Schools in the effective use of ICT. Inclusive Technology also ran the British assistive technology industry’s annual showcase “The Special Needs Fringe” at the Olympia Hilton for ten years. Inclusive Technology was in at the foundation of the Assistive Technology Industry Association (ATIA) in America and the British Assistive Technology Association in the UK and has served on the Boards of both. In America, in 2002, the company set up Inclusive TLC Inc. in New Jersey. The USA is now the largest market for the Company’s new online subscription products, HelpKidzLearn and ChooseIt! Maker 3. Since 1997 Inclusive Technology Ltd has supplied a total of £69 million of special needs resources mostly in the UK. Educational spending cuts on both side of the Atlantic have created a challenging market and the very accessible iPad has disrupted a difficult market further (to the great benefit of learners with special needs!). Inclusive Technology’s on-line offerings are now growing at 60% a year and more than half of this income is from outside the UK. It’s ground breaking eye gaze software has already been recognised with the 2015 Special Education Resources Award. A small outfit started by three teachers has grown into a major supplier of computer based learning to the children who face the greatest challenges. We will be around meeting their needs for many years to come.